Amethyst is a gemstone that is loved by many, and with its appearance in this plain amethyst cross necklace in 14K white gold from Apples of Gold Jewelry, it's easy to see why! The royal purple color of the genuine amethyst gemstone brings out the white color of the white gold, giving the entire pendant a vibrant appearance. The amethyst stone is nestled nicely into the pendant with a prong setting, which has 4 prongs holding the AA rated stone in place. The pendant measures 1 inch tall and 1/2 inch wide, while the gemstone is 1.75mm in size. "If my people, which are called by my name, shall humble themselves, and pray, and seek my face, and turn from their wicked ways; then will I hear from heaven, and will forgive their sin, and will heal their land. "(2 Chronicles 7:14). 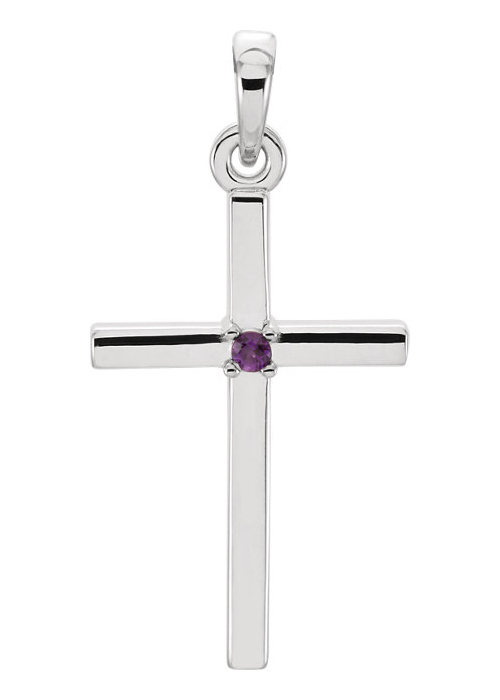 We guarantee our Plain Amethyst Cross Necklace, 14K White Gold to be high quality, authentic jewelry, as described above.